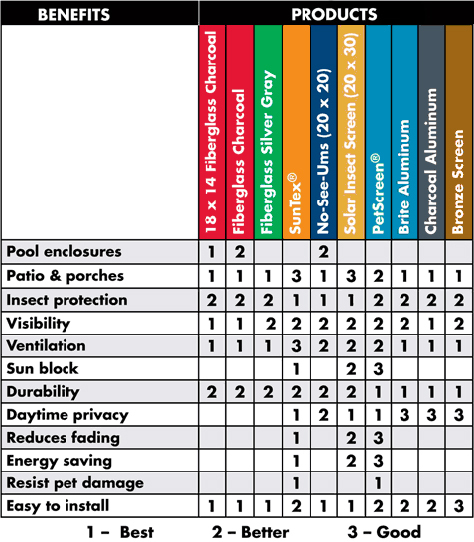 Our most popular choice for replacement window screens. Industry standard window and door mesh. Offers good ventilation and insect protection (18x16 mesh). Fiberglass is the most common type of window screen material and is the material found on the majority of screens in new windows. Fiberglass is strong, long lasting and has some flex to it, so it does not bend like aluminum material does when something bumps into it. We use Phifer fiberglass in our screens, so you know you are getting a quality product. Fiberglass comes in two colors: charcoal (which is for the most part black) and gray. Fiberglass Insect Screening is woven from permanent glass yarn and coated with a protective vinyl to ensure lasting beauty, color and flexibility. It is produced under the most exacting conditions to meet extremely rigid specifications. This Fiberglass Insect Screening is noncombustible and will not rust, corrode or stain. internal pieces and the aluminum frames are heavier duty. purchase. Am ordering for rest of house now.